I've been in Dubai for a while now – and have had the good fortune to own and drive several different nameplates. Range Rover, Infiniti, Pajero, VW Touareg, BMW X5, Prado. Then I got a Q7, and now a Q5 3.0 S Line Turbo. Don't get me wrong – I love the way the Audis drive. The Q5 is a rocket on rails. And, yes, I did like the whole in-showroom, during-sales experience. But the real reason, and perhaps the lead reason I give Audi a lead 'share of garage' is after sales. The service experience at Al Naboodah on Shk Zayed Road for me has been legend. Attention to detail, on-time delivery, the courtesy car-wash are all givens I guess in the segment. But it's the courtesy, the way their service team works – even though under pressure – is really world class. I recently had a problem with a sun-roof blind on my new Q5. Called my old favorite Service Manager – Steven, at Al Naboodah in Dubai last evening. This morning, my car was taken in, and it should be fixed this evening. The responsiveness, him remembering me by name, recalling my plate number by heart. That's what sells me a car. Not pre-sales, not sales, not driving experience (all of which are good). It's the amazing after-sales! Service team at Audi Dubai – Steven, Benny, Roshan (the team leader) – #Respect! Keep it up! The service team leader Roshan told me that it's going to get even better with their spanking new facility that's coming up – and I look forward to that. I work closely with a few leading car brands in my line of work – and when we discuss loyalty, re-purchase, advocacy and all those grand marketing ideas I use one example. Audi. And I hope that marketers, ad agencies and social specialists are taking note. This is not a trend. It's a given. 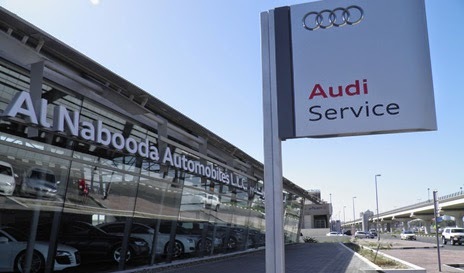 Thanks for the feedback on Al Nabooda Automobiles. There are so many car owners who are interested to know more about car dealers and their reputation. Our website, www.yallamotor.com seeks to collect feedback from car owners so we can provide local automotive guidance to the community. In this context, this is a great piece of advice you have shared with the community.